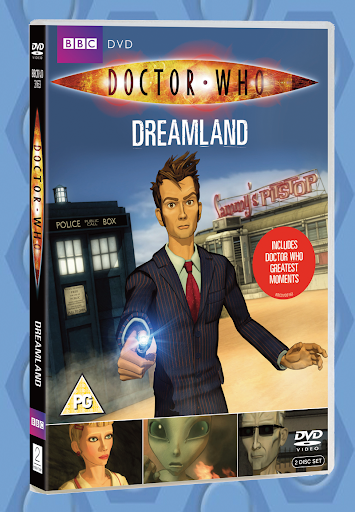 Created in eye-catching high definition 3D animation, Doctor Who: Dreamland sees the Doctor with two new companions – Cassie Rice and Jimmy Stalkingwolf - and pits him against a new alien race, the monstrous Viperox, led by Lord Azlok. Serving up all the traditional Doctor Who ingredients, excitement, drama and humour, this animated adventure is released on DVD from Feb 1, 2010. Click on the pic above for a bigger, Tennantier version. Doctor Who’s Greatest Moments - a 3 x 60 minute retrospective taking viewers on a journey through time and space to relive action from the legendary sci-fi show from 2005 onwards, featuring exclusive interviews with key actors offering unique insights on the classic moments. Split into three programmes, The Doctor, The Companions and The Enemies.